There’s plenty to do on the property so this week will be a staycation. I took paid vacation from the home, farm and auto supply store. On day three of an eight day work hiatus, I left the property twice, visiting the warehouse club both times. I return to work next Saturday when my season at the orchard officially begins. There are five stops on the staycation itinerary: the garden, the yard, the garage, the kitchen and my storage/study areas. It should be fun. Yesterday was Mother’s 89th birthday. We had a nice telephone chat. She has trouble moving around because of arthritis, and no longer reads printed books because of macular degeneration. She seemed mentally alert as we reviewed her recent reading from an audio book subscription. We talked about her mother. Busha moved from the farm to Minneapolis at a young age. She took a job in a Chinese restaurant where she learned to prepare chop suey, according to Mother. I’m not sure “Chinese” is accurate, but the dish she learned and taught Mother has a unique flavor I’ve not encountered elsewhere. Mother said she continues to make chop suey from time to time. It’s getting to be time for a visit. And so it goes. Time to get outside and take advantage of the temperate weather. While the rest of the world bakes, it is good as it gets here… at least for the moment. Later I’ll return to the kitchen to prepare a meal with some of the morning harvest. 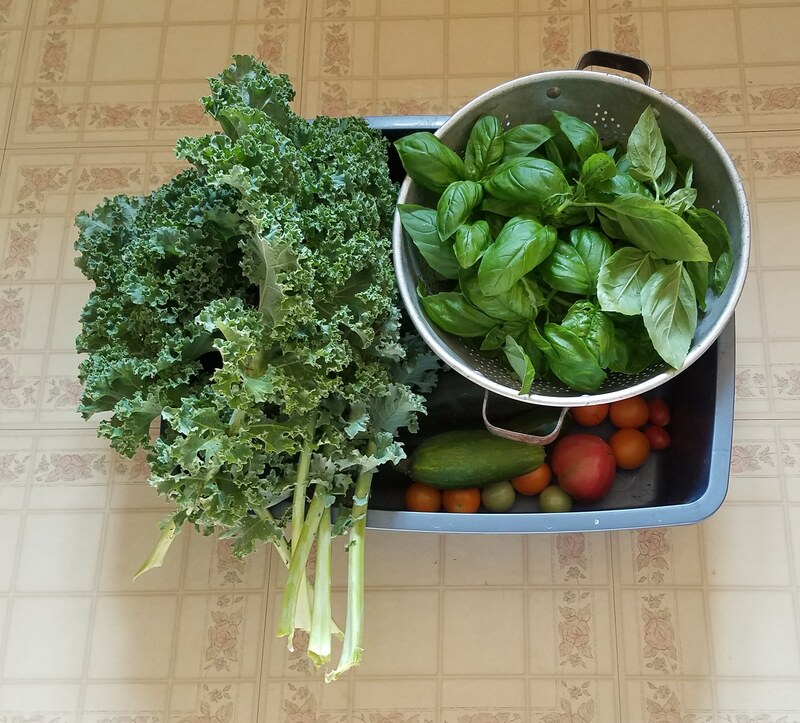 Summer gardening has been pretty good despite Spring’s late start. This entry was posted in Home Life, Writing and tagged #amwriting, homelife, Writing. Bookmark the permalink.